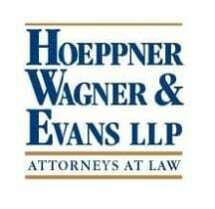 With a history that dates back over 100 years, the law firm of Hoeppner Wagner & Evans has become the trusted source for quality, effective representation to the residents and businesses of northwest Indiana. Our decades of combined legal experience and vast network of professional resources mean that we can help you find solutions to your legal challenges efficiently. No matter the circumstances surrounding your case or the complexities involved, we promise to work directly with you to assert your rights, protect your interests and help you achieve the most favorable outcome possible. Recognized for our impeccable professionalism and long record of success, our attorneys have received numerous awards and honors, including AV Preeminent peer review ratings* from Martindale-Hubbell, and Best Lawyers voted our law firm among the best in the region for the past several years. To find out more about how Hoeppner Wagner & Evans can best serve your needs and help you achieve the positive results you seek, you can contact our Valparaiso law office to schedule a consultation.